Volume 32, No. 2 features some great readers' models in its opening pages ,followed by Part 4 of Harry Woodman's revised 'Modelling Vintage Aircraft in Plastic Card' thesis where topics such as detailing engines, creating exhausts,radiators and cockpits are all supported by sketches and many unique reference photos in colour and contemporary monochrome. There are scale plans from Bill Kerka -of the ultra-rare Scutte Lanz D.IV fighter of 1918-and exacting 1:48 GAs of the late version BE2a by Mick Davis.For builders of new Merit and Wingnut Wings' Camels we have a special four page Warpaint feature with superb colour profiles, whilst James Fahey presents multiple close-ups of the newly restored TVAL Camel over four more pages. Elsewhere,David Byers describes the Western Electric flight helmet and there are reviews of six new figures ,plus a large array of accessories and a detailed assessment of Aviattic's new Daimler truck. Ray Rimell presents his fifth Wingnut Wings modelling Special; this one devoted to the Sopwith Camels-with 'bonus' material on the LVG C.VI. Hundreds of colour photos, plus colour profiles,build logs and more. 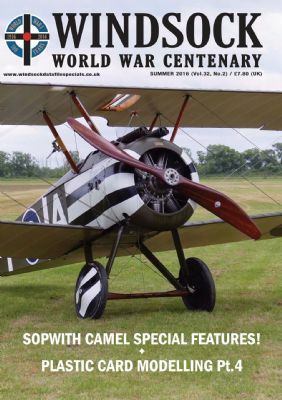 Volume 32, No.3 is now published with Harry Woodman's scratchbuilding series, Aviattic Ansaldo preview with supporting archive material,Stow Maries photo shoot and more Camel profiles! LOW STOCK! Now in its third printing, this is the ultimate Camel reference and remains one of our best sellers in constant demand! Includes many close-up detail photos,a double page cutaway drawing,scale plans and three colour profiles. The last issue of Windsock EVER contains the usual mix of high grade reference and modelling material with Camel and Pfalz colour profiles, conclusion of two popular series and exclusive reviews! THE first Datafile of 2014 could hardly be more appropriate. Here is the story of the early BE2 series that went to war in August 1914. With over 67 photos and great new drawings based on RAF blueprints. 10 Long View, Berkhamsted, Herts, HP4 1BY.